1. Credit and Debit card, we accept Visa, Mastercard, Maestro and Visa Electron. 2. 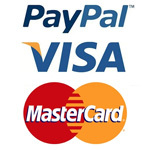 Paypal, If you have a Paypal account you can pay directly from there. 3. We can also usually take payment via BACS, Cheque or Postal Order, please contact us if you would like to pay via this method. We reserve the right to credit and cancel any orders that may appear to be fraudulent or incomplete. It is our policy to report all instances of Credit Card Fraud. All credit card numbers are encrypted in the software when the order is placed using 128 bit encryption. Upon placing an order, the customer agrees that the information given on the order is correct. Any changes to customer order information will be made at our discretion. All goods are subject to availability. If we do not supply at item for whatever reason your credit card will be refunded the full purchase price of that item. We will not be responsible for compensating you for any other losses which you may suffer if we do not supply the goods. We will occasionally use your email address to send you details of offers/new products we think may be of interest to you. If you would prefer we did not, please contact us. Delivery will normally be made within 3 to 4 working days but some items may have a longer lead time. Please get in touch if you require something urgently and we will do our best to accommodate you. We shall not be liable for any losses, costs, damages, charges or expenses caused by any delay for delivery of the goods. Although 4Kam will try to be of as much assistance as possible if you are having technical difficulties we cannot be held responsible if your own equipment is not entirely compatible with our products. All items are tested prior to dispatch so it is unlikely there is a problem with your goods even if there appears to be an issue initially. Please read the manuals thoroughly and check our FAQ's and Top Tips pages before contacting us for assistance as most setup problems can be solved quickly and easily. All products sold via the website have a 12 months manufacturers warranty. We are happy to repair or replace any product that has a technical problem caused by a manufacturing fault. Faulty items may be returned to us within 12 months of purchase, they will then be tested and repaired or replaced. Please contact us before returning any product, failure to do so may result in a longer than necessary turn around time. The warranty on the replacement item will run for the balance of the original 12 months. The cost of returning the goods to us shall be met by the customer. Problems occurring as a result of damage or misuse by the customer are not covered under warranty (but may qualify for the crash replacement policy below). We are always happy to give support for equipment outside of the warranty period, please contact us for free advice in the first instance as the issue may be easily resolved. If our team suggests your product(s) should be returned for inspection then this will incur a minimum fee of £35 (covering inspection and return postage (UK only)). If any further costs are incurred for repairs or replacement parts you will be informed by our team. Unwanted items may be returned to us within 14 days of purchase if they are in a new, unused, and re-saleable condition. Please contact us detailing the reason for the return and to have a returns form sent to you. This form should be filled in in its entirety and returned with the goods, a refund will then be made upon the receipt of these less postage and a small restocking fee. The cost of returning the goods to us shall be met by the customer. If the goods are returned outside of the 14 day period, are incomplete or damaged in any way they will NOT be eligible for any refund. A restocking fee of 30% will be applicable for any goods returned in a open box condition. Custom orders will not be eligible for any refund unless terms are agreed prior to purchase. Any parcels being sent from overseas (ie not from an address not within the UK) should be clearly marked 'RETURN UNDER WARRANTY' on the outside of the package. If a customs declaration is required the package should be marked as having 'no commercial value' or at a nominal amount, for example £5. Failure to do this may result in customs charges being applicable, payment of which the customer will be liable for. If you have an accident using your 4Kam or 46Kam which causes the camera to be damaged beyond repair you will not need to pay the full price for a new one. 4Kam has a Crash Replacement Policy which entitles the customer to a replacement camera at least 25% off the RRP. Contact us if you need to make a claim on the policy. All site content including text and images remain the property of 4K Systems and cannot be copied or displayed elsewhere without our written permission.